Choosing toys for 5 year old boys and girls can be difficult if you don’t have children that age. At five years old, they certainly aren’t babies anymore, but also are far from their teen years. Personally, I like to look for educational toys for children. These days it’s easy to find exciting smart toys that are fun, interactive, and educational. Gone are the days where educational gifts mean boring gifts. There is no shortage of gadgets out there geared toward children. It feels like evolution has babies entering the world with an instinctual knowledge about electronics. I mean, I know moms who ask their young ones for help with their iPhones! Technology innovations only seem to move faster, so I think parents should most definitely feed hungry tech brains. 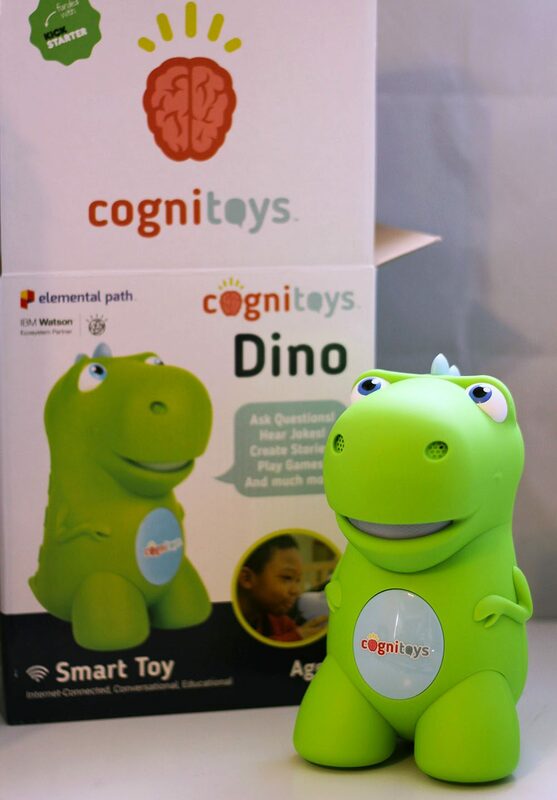 We received the new Dino from CogniToys to experience for ourselves. Thanks to Elemental Path, the most interactive toy on the market will quickly become a child’s new best friend. CogniToys are the award-winning next generation of internet-connected smart toys that learn and grown with children, bringing a new gateway of smart, entertaining, and interactive learning to children without the need for a screen. 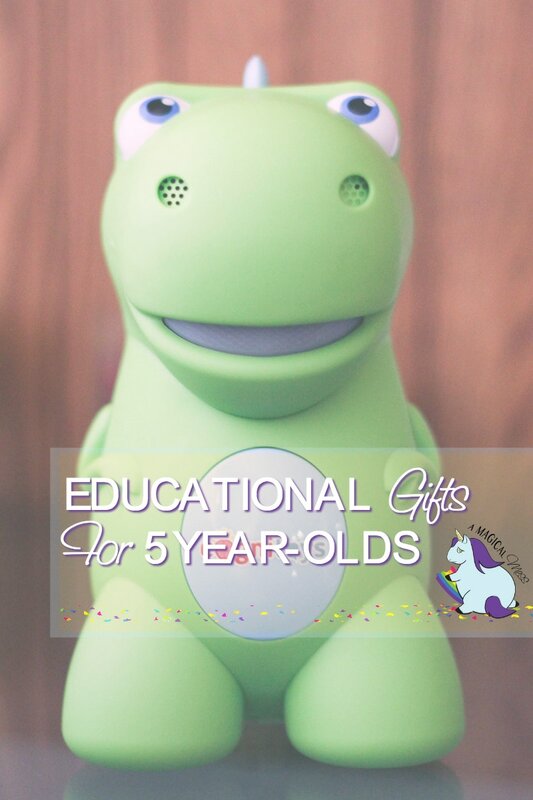 The Dino is IBM Watson-powered, cloud-based, and wi-fi enabled, allowing kids to engage in intelligent conversation unlike any other toys currently on the market. CogniToys make great toys for 5 year old boys and girls and will be their digital companion as they grow. The suggested age is 5-9 years old, but your child can be the judge of that. Children can participate in activities like storytelling, questions and answers, games, and more with their Dino. The Dino is a smart toy, so it listens to kids’ questions and adapts to their interests. It’s not like other tech toys with pre-programmed answers. Each toy comes with access to the CogniToys Parent Panel, a platform that provides analytics on a child’s progress for parents to review. I don’t know, but that sounds like a homeschooling tool to me. Requires the app and wi-fi to connect initially. Use code: MagicalMess10 to save 10% off your purchase at CogniToys.com. If you know a child who is interested in science early, by all means nurture that. We love all of the books in the National Geographic Kids line. The Weird but True facts books are packed with interesting tidbits for the whole family to enjoy. Learning is extra fun paired with the stunning visuals in each book. There are affordable educational gifts out there. Here are a few that caught our eye. Do you have any educational gift ideas for boys and girls to add? Dino from CogniToys seems like a lot of fun! Interactive toys are the best. I’ve seen the Kinetic Sand on TV & it looks interesting. Kids would love playing with that. These are all great picks. I love Dino. He’s super cute, and I think my daughter would love him. Thanks for the heads up. I’ve been at a loss for her this year. I love toys that are fun that also encourage learning. That dino is super cute, I bet my son would have enjoyed it when he was younger. We also recommended the Balance Beans game! It’s so perfect for kids that age! That dino looks like such a fun toy! Thanks for all of the great recommendations. Lots of great ideas! I love toys that get the kids thinking creatively. I haven’t heard of any of these products, thanks for the shopping inspiration.